Position is cyclic: indicates whether the joint position is cyclic (varies between -180 and +180 degrees without limitation). Only revolute joints can be cyclic. Screw pitch: the pitch value of the joint. This property becomes available only with the Revolute/Screw-type of joint, when the Position is cyclic-checkbox is left unchecked. Position minimum: the minimum allowed value of a non-cyclic revolute joint, a screw, or a prismatic joint. Position range: the variation range of a non-cyclic revolute joint, a screw or a prismatic joint. A position of such a joint is limited between Position minimum and Position minimum+Position range. Position: intrinsic joint position of a revolute joint, a prismatic joint, or a screw. IK calculation weight: weight of the joint during inverse kinematics calculations. In the case of a redundant manipulator for instance, this option enables you to favor certain joints over others during inverse kinematics resolution. A joint with a smaller weight will have a relatively smaller positional variation compared to other joints. Maximum step size: maximum positional variation permitted during one kinematic calculation pass. A smaller step size usually results in longer calculations, but can be more stable. For inverse kinematics calculations, this value can be overridden by the Ignore max. step sizes item in the inverse kinematics dialog. Mode: the control mode of the joint. A joint can be in passive mode, in inverse kinematics mode, in dependent mode, or in torque/force mode. Hybrid operation: when the joint is in passive mode, inverse kinematics mode or dependent mode, it can optionally also be operated in a hybrid fashion: hybrid operation allows the joint to operate in a regular way, but additionally, just before dynamics calculations, the current joint position will be copied to the target joint position, and then, during dynamics calculations, the joint will be handled as a motor in position control (if and only if it is dynamically enabled). Refer to the joint types and operation section for details. Adjust dependency equation: if the joint is in dependent mode, then a linear equation can be specified that links the joint to another one. The values in this section of the dialog are all indicated in meters or radians. Length: length of the joint. Has no functional meaning. Diameter: diameter of the joint. Has no functional meaning. Adjust color A / B: color A is the color of the fixed part of the joint, color B is the color of the moving part of the joint. Show dynamic properties dialog: toggles the joint dynamics properties dialog. 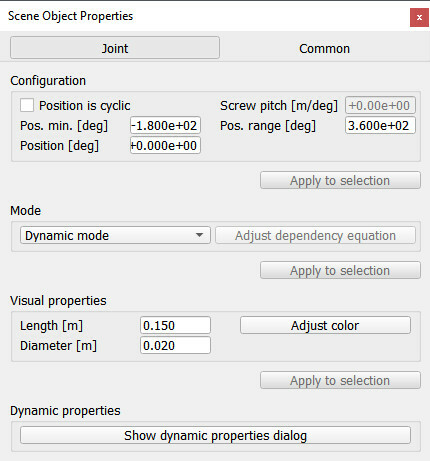 The joint dynamics dialog allows to adjust a joint's dynamic properties.